In the world of Light-Sport Aircraft, we have more than 90 manufacturers and 145 Special LSA (see our whole list) accepted* by FAA. This huge diversity of design has given recreational pilots around the world a large number of ready-to-fly aircraft choices beyond anything we have seen in aviation since the beginning. However, the old 80/20 rule still applies where (approximately) 80% of the aircraft sold are built by 20% of the manufacturers. It is a credit to this 14-year-old industry that even the smaller companies can remain viable enterprises. Very few of the 90+ manufacturers have left the business. However, most of the airplanes are made by a few top producers, which you can see in our market share charts. 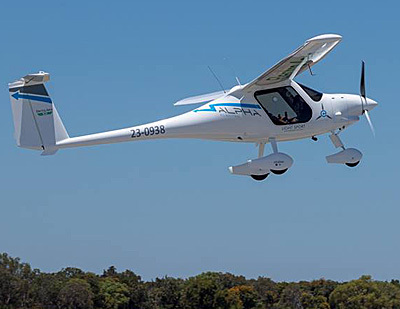 "Serial Number 900 leaves the factory headed for Australia," glowed Michael Coates, the longtime distributor for Pipistrel aircraft in Australia and the United States. "It’s hard to believe that the time passes so quickly and here we are shipping number 900 from the Sinus/Virus family to a very excited customer in Australia." In Virus (yes, I've heard most the jokes about the name) Michael refers to the best seller of the comprehensive Pipistrel line. The reference here is to Virus SW. While the company has succeeded with a number of their other models, Virus SW — the shorter wing span and higher cruise speed variation — is the clear front runner among their production. Pipistrel started with weight shift trikes, way back in the days of Soviet-controlled eastern bloc countries. Founder Ivo Boscarol had to sneakily build his first and fly it only in the evening when few might notice. After the Berlin Wall fell and freedom came to these countries Boscarol was able to embark on an ambitious plan to build his company into the light aircraft powerhouse it is today. This is a man who can barely sit still long enough for an interview as he is managing a number of activities and appears always thinking of the next thing. Coates observed that the 900 aircraft does not include motorgliders Taurus or Apis, GA candidate Panthera, nor does it include 200 Alpha Trainers delivered to the Indian armed forces and or other government aircraft. "Several experts from Pipistrel who can answer all of your electric aircraft questions," Michael assured. "We will also have 10,000 copies of the new Pipistrel Magazine available for giveaway," said Coates. "This magazine features the full history of Pipistrel along with the different projects we have been involved with in the past 30 years." Such company magazines used to be called "house organs" and Pipistrel's features information about the whole aircraft line. 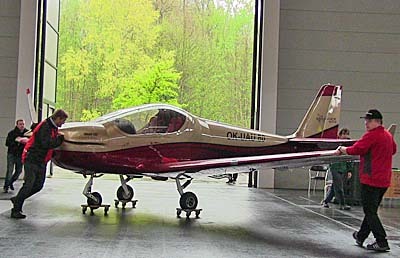 Pipistrel was established in 1987 as a small backyard workshop and registered as a company in 1989. It started as a producer of powered hang-gliders, but in the 30 years of operation it has grown into an influential, internationally renown company * A very common mistake is to refer to FAA accepted SLSA as "certified." This is incorrect. SLSA that FAA has approved have demonstrated compliance to ASTM standards and have verified their quality processes and best practices to FAA examiner's satisfaction. They may have proven this via an official FAA audit but they are not "type certified." TC aircraft get "Standard" Airworthiness Certificates. SLSA get "Special" AW Certs. Other countries that use ASTM standards as a basis for approval sometimes add their own "certifications." In the world of Light-Sport Aircraft, we have more than 90 manufacturers and 145 Special LSA (see our whole list) accepted* by FAA. This huge diversity of design has given recreational pilots around the world a large number of ready-to-fly aircraft choices beyond anything we have seen in aviation since the beginning. However, the old 80/20 rule still applies where (approximately) 80% of the aircraft sold are built by 20% of the manufacturers. It is a credit to this 14-year-old industry that even the smaller companies can remain viable enterprises. Very few of the 90+ manufacturers have left the business. However, most of the airplanes are made by a few top producers, which you can see in our market share charts. Pipistrel is One of the Leaders “Serial Number 900 leaves the factory headed for Australia,” glowed Michael Coates, the longtime distributor for Pipistrel aircraft in Australia and the United States. 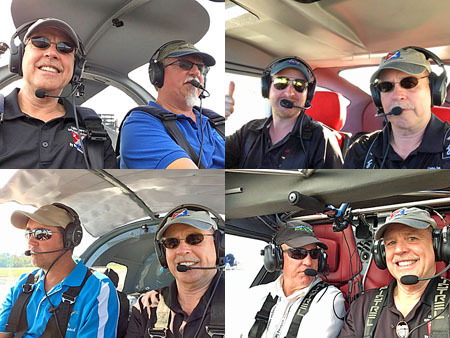 One bone of contention among LSA sellers is that legacy flight schools — the sort that typically uses Cessna or Piper trainers — sometimes disregard LSA as trainer aircraft. "They're built too lightly." "The nose wheels are too weak." "My mechanic doesn't know the Rotax engine." Some may have even more creative excuses. I've interviewed many producers that are frustrated with this outdated response. Several have cited specific aircraft that have done flight school duty for thousands of hours and tens of thousands of landings. Yet the ill-informed attitude of such school operators has not stopped sellers from trying. 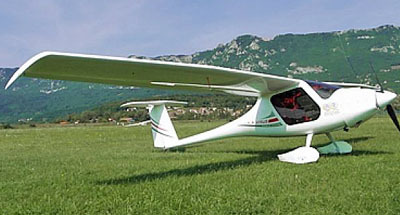 One such dogged entrepreneur is Michael Coates, the Australia-based largest dealer for Slovenian LSA producer, Pipistrel. 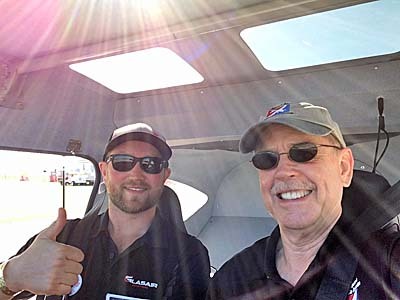 "After months and months of evaluation, writing proposals, flight tests and endless emails," Michael wrote, "I am very proud to announce our single biggest order into the USA flight training market." He referenced an order for 15 Pipistrel Alpha Trainer aircraft with instrumentation configured for IFR training (photo) ordered for delivery to San Bernardino, California. World Wide Wings (WWW) operates facilities in Florida and California that specialize in training pilots from all over the world and, in particular, Indian students. They train from first-flight through to all the certificate levels up to type ratings on Boeing 737 & Airbus A320. These are the most-widely used commercial airplanes in the Indian markets. Successful students get an FAA certificate that is recognized globally. WWW is run by active airline pilots and has trained 500 students; they have joined with San Bernardino Valley College as their academic training partner. 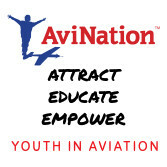 “We have been looking for a suitable LSA [basic] trainer for our flight schools in Florida and California for quite some time," stated WWW principal, Naushad Imam. "The old Cessna and Piper [aircraft] still being widely used by most flight schools in the U.S. did not fit our profile for a host of reasons." 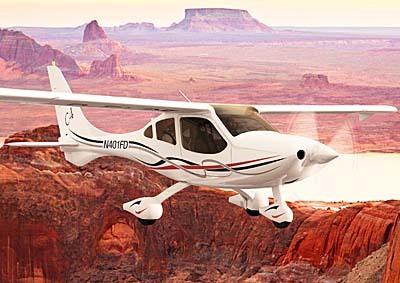 WWW considered SportCruiser, Tecnam, Skycatcher, Flight Design, Evektor, Pipistrel and a few others. "We leased and put some of these airplanes to work in our training environment," "This provided a very good understanding of their suitability in terms of safety, performance(s), maintenance, handling, durability, serviceability and up times," the school indicated. "Feedback from students was also very helpful." Earlier, the Pipistrel factory sold 200 Alpha Trainers to the Indian military. "Their feedback on the aircraft durability was a consideration," observed WWW. Another factory affective the sales was a report of a Pipistrel Alpha Trainer in New Caledonia that recently surpassed 4,000 hours of training in a challenging tropical/marine environment; the aircraft has not reported problems. Deliveries from Pipistrel's Italy production facility will start later this month, with delivery and commissioning in San Bernardino scheduled for the first week of June, 2018. More than 300 Pipistrel Alpha Trainers have been produced and are flying in 35 countries including almost 50 in the USA alone, reported Coates. 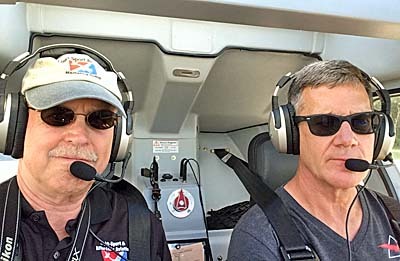 One bone of contention among LSA sellers is that legacy flight schools — the sort that typically uses Cessna or Piper trainers — sometimes disregard LSA as trainer aircraft. “They’re built too lightly.” “The nose wheels are too weak.” “My mechanic doesn’t know the Rotax engine.” Some may have even more creative excuses. I’ve interviewed many producers that are frustrated with this outdated response. Several have cited specific aircraft that have done flight school duty for thousands of hours and tens of thousands of landings. Yet the ill-informed attitude of such school operators has not stopped sellers from trying. One such dogged entrepreneur is Michael Coates, the Australia-based largest dealer for Slovenian LSA producer, Pipistrel. 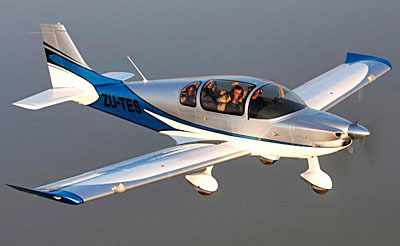 “After months and months of evaluation, writing proposals, flight tests and endless emails,” Michael wrote, “I am very proud to announce our single biggest order into the USA flight training market.” He referenced an order for 15 Pipistrel Alpha Trainer aircraft with instrumentation configured for IFR training (photo) ordered for delivery to San Bernardino, California. One word can make a huge difference. This unassailable logic was recently put forth by Michael Coates of Australia regarding the LSA regulation. The offensive word? —Reciprocating. Pipistel’s Alpha Electro takes off in Australia, reportedly the first pure electric flight trainer in the country operated by Electro.Aero. As a Slovenia-based company, Pipistrel been a leader in electric propulsion, winning (literally!) millions from NASA for their success with electric propulsion. However, they cannot sell an electric-propelled SLSA in the United States. They can in Australia and Canada. 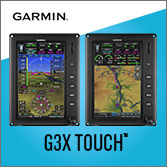 Recently the down-under country approved Electro for use by a flight school. This Alpha Electro "is a normal production Pipistrel Alpha Electro and was commissioned on January 2nd 2018," wrote Coates. "The aircraft was awarded an SLSA certificate by CASA and it is used at the fifth busiest airport in the southern hemisphere, mostly for flight training. The operators now have around 70 hours in temperatures above 35°C (95°F). Michael explained, "The Australian aviation standards do not have the word 'reciprocating' when describing the engine system of an LSA aircraft so the plane can be registered as a 'certified' LSA for flight training in Australia, unlike the USA." In normal pattern flying the fight school is logging 60-minute flights and completing between 8 and 10 takeoffs and landings per training session. Recharging is taking between 45 minutes and 1 hour 15 minutes depending on the temperatures. Michael said that when the temperatures rises above 35°C charging slows down to keep the batteries under their maximum temperature. One word can make a huge difference. This unassailable logic was recently put forth by Michael Coates of Australia regarding the LSA regulation. The offensive word? —Reciprocating. It sounds so innocent until you consider what that word prevents in the USA. Like so many laws and regulations, the original idea didn’t work out anything like what was intended. In its ground-breaking — I’m tempted to write “daring” — Sport Pilot / Light-Sport Aircraft regulation of 2004, FAA specified that all LSA must use only a reciprocating engine. Their stated goal was to avoid turbines that were thought too complex for the “simple aircraft flying in simple airspace” mantra of the day. (For the record, numerous airline pilots I know confirmed that turbines are far simpler than any reciprocating engine. They do require different techniques that are not familiar to recreational-only pilots but they are actually very easy engines to operate, say these professional pilots.) Regardless, FAA’s word choice not only prevented turbine engines but unknowingly prevented electric propulsion as well. Article Updated: 9/18/17 (see below) Electric airplanes continue to catch the headlines… but don't impact the market much (yet). That may be changing. You rarely see advertising for Pipistrel, the Eastern European builder of several very sleek Light-Sport Aircraft. The company feels they generate interesting-enough news that media organizations will cover their accomplishments. As this and other articles prove, perhaps they're right although most publications depend on advertiser support to allow them to provide coverage. An example of how Pipistrel seduces the aviation press is with an announcement proclaiming their partnership with ride-sharing giant, Uber …specifically about that tech company's aerial ambitions. At the recent Uber Elevate Summit in Dallas, Texas, "Uber signed a partnership with Pipistrel aircraft producer for large-scale deployment of electric vertical take-off and landing vehicles (VTOLs)." Pipistrel said initial vehicles [will] be used in a flight demonstration by 2020. "Pipistrel is the only company in the world that builds and sells electric aircraft today … they are a valued partner in making Uber’s VTOL network a reality," said Mark Moore, Director of Engineering for Aviation. He's wrong about Pipistrel being the "only company" working on such developments but the impact of his quote is nonetheless impressive. On another front closer to home, Pipistrel announced working with academic and engineering partners for a "prototype of the first electric charging station for airplanes." "The goal of the project was the production and installation of a (public) charging station for electric airplanes, because the need for a stationary type of charging has been shown," wrote the company. On August 30th, 2017 the electric charging station was officially turned on at the Pipistrel company and was used to charge one of their Alpha Electro aircraft. The project was "financed by the Ministry of Education, Science and Sport and the European Union from the European Social Fund." 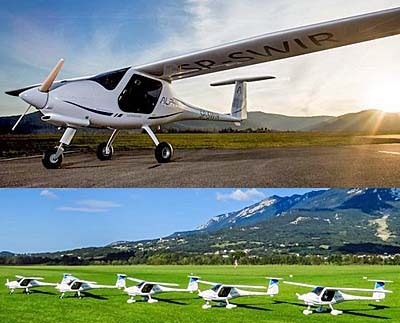 In Pipistrel's 25 years, the Slovenian company has produced 600 aircraft of the Sinus-Virus family (the ones most familiar to Americans) plus 120 aircraft of the Taurus-Apis family (motorgliders and gliders). 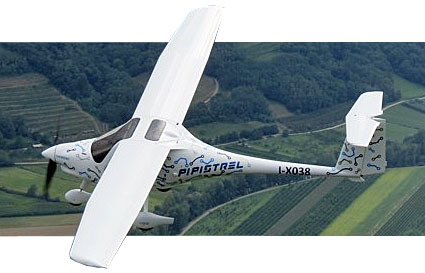 Together with approximately 500 weight shift trikes — the aircraft that started this company back in Soviet times — Pipistrel has manufacturered about 1,300 aircraft. Update 9/18/17: According to Pipistrel's Australian dealer, Michael Coates, the numbers on the company website are dated and the aircraft produced total is now 1,260 units. Adding the 500 trikes, their total shipments some 1,750 aircraft. A few producers have delivered even more in the LSA or LSA-like space, but not many. Italy's Tecnam is the clear leader, well ahead of all others, followed by German builders such as Flight Design, Icarus Comco, and gyroplane builder, AutoGyro. Honorable mentions are deserved for other players in fully-built aircraft: The Airplane Factory and Jabiru. Big as Cessna and Piper may be in GA aircraft, their success in LSA sales is far smaller than the others mentioned. Based on deposits, Icon may be a future volume leader but their ramp-up is still in process. We are unable to factor in kits from producers like Americans such as Sonex, Van's, Rans, or Zenith as they are difficult to accurately count, given widely varying names for each (a homebuilt has the builder's name as its manufacturer, for example). FAA N-number registration data entry clerks can be excused for not knowing each of these many variations. With similar regrets and for the same reason, we do not include figures for weight shift trikes, powered parachutes, powered paragliders, or gyroplanes but these add measurably to the total LSA or LSA-like aircraft flying all over the globe. Will electric aircraft producers change this ranking order? Only time will tell. Meanwhile you can follow our market share data at this link. Article Updated: 9/18/17 (see below) Electric airplanes continue to catch the headlines… but don’t impact the market much (yet). That may be changing. You rarely see advertising for Pipistrel, the Eastern European builder of several very sleek Light-Sport Aircraft. The company feels they generate interesting-enough news that media organizations will cover their accomplishments. As this and other articles prove, perhaps they’re right although most publications depend on advertiser support to allow them to provide coverage. An example of how Pipistrel seduces the aviation press is with an announcement proclaiming their partnership with ride-sharing giant, Uber …specifically about that tech company’s aerial ambitions. At the recent Uber Elevate Summit in Dallas, Texas, “Uber signed a partnership with Pipistrel aircraft producer for large-scale deployment of electric vertical take-off and landing vehicles (VTOLs).” Pipistrel said initial vehicles [will] be used in a flight demonstration by 2020. “Pipistrel is the only company in the world that builds and sells electric aircraft today … they are a valued partner in making Uber’s VTOL network a reality,” said Mark Moore, Director of Engineering for Aviation. We first knew of this project as WATTsUP. That name was fun but as the project came to production, it was renamed Electro ... basically their Alpha but with electric propulsion. In this interview, Dan Johnson speaks with Light Sport and Ultralight Flying editor and longtime pro photographer, James Lawrence, about his upcoming visit to Pipistrel in Slovenia. James recently spoke to chief engineer Tine Tomazic who provided some operational details on matters like endurance, recharging, regenerative charging and more. We first knew of this project as WATTsUP. That name was fun but as the project came to production, it was renamed Electro … basically their Alpha but with electric propulsion. In this interview, Dan Johnson speaks with Light Sport and Ultralight Flying editor and longtime pro photographer, James Lawrence, about his upcoming visit to Pipistrel in Slovenia. James recently spoke to chief engineer Tine Tomazic who provided some operational details on matters like endurance, recharging, regenerative charging and more. MIDWEST LSA EXPO 2012 -- One of our series of many short videos from the fall show, this one is one of the newest in the LSA fleet. This is Pipistrel's Alpha Trainer and it has already seen market success in the USA and around the world, thanks significantly to its excellent price: $85,000 (in 2012 and before expenses like shipping and FAA registration). Simple, yes, but Alpha has all a recreational pilot might want. MIDWEST LSA EXPO 2012 — One of our series of many short videos from the fall show, this one is one of the newest in the LSA fleet. This is Pipistrel’s Alpha Trainer and it has already seen market success in the USA and around the world, thanks significantly to its excellent price: $85,000 (in 2012 and before expenses like shipping and FAA registration). Simple, yes, but Alpha has all a recreational pilot might want. Pipistrel, headquartered in Slovenia with U.S.-bound manufacturing done in nearby Italy, has a line of interesting models. In this video we examine the Virus SW, for Short Wing. We've previously reviewed the long wing version and the Sinus motorglider. In addition this company makes a powered sailplane and they started with weight shift trikes. Pipistrel has also distinguished itself with a string of victories in NASA efficiency contests, more recently winning an astounding $1.3 million. 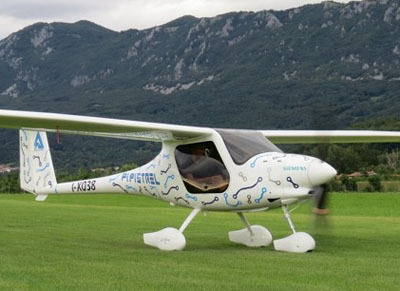 Pipistrel, headquartered in Slovenia with U.S.-bound manufacturing done in nearby Italy, has a line of interesting models. In this video we examine the Virus SW, for Short Wing. We’ve previously reviewed the long wing version and the Sinus motorglider. In addition this company makes a powered sailplane and they started with weight shift trikes. Pipistrel has also distinguished itself with a string of victories in NASA efficiency contests, more recently winning an astounding $1.3 million. 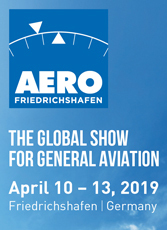 The great show of Europe called Aero Friedrichshafen is about to begin. It starts officially tomorrow and runs through Saturday (April 20-23, 2016). I've lost count, but believe this is my 20th year of attending, far more than any other European show. 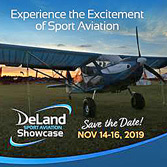 As he worked to help exhibitors and manage the million details of his event, boss Roland Bosch said the event started in 1977, meaning next year would be its 40th, but... Aero alternated years from 1977 through 1991 (as do many European airshows). With the 1993 event it went annual, meaning this is the 31st Aero. On Monday, the vast 11 halls of the Messe (the facility name) were largely empty but slowly becoming populated with airplanes. In all of the gymnasium-sized halls with their elegant curved wood roofs, workers assembled displays. In Halls B1, B2, and B3 — where the light aircraft I follow are concentrated — displays are more elaborate than anything we typically see at U.S. shows. However, in the A-side halls, displays are magnificent, much like what one sees at the National Business Aircraft Association events (see Continental booth photo below.) I enjoy observing the set-up effort. I've gone to many airshows and I am always amazed at this: on the evening before the show opens, chaos appears to reign. I can envision no chance it will all be ready in time. Yet, hours later as the entrance gate opens, booth spaces (called "stands" in Euro-English) seem completely finished, serenely awaiting the rush of first attendees. It's a marvelous transformation I've witnessed again and again. As they set up their spaces, aircraft can be seen before they are dolled up for public consumption. I caught the retractable version of the BRM Aero Bristell. We may not see this airplane in the USA as the Light-Sport regulations don't permit retractable land planes (though, obviously, amphibious LSA seaplanes use what was once called "repositionable gear." I'm guessing this Bristell is quite a speedster that likely exceeds LSA's 120-knot speed limit in America. Pipistrel, as you will read in my market share post to follow, continues to move up the U.S. LSA market ranking and this company refuses to sit still. Today, an announcement boasted that their Virus SW 121 has achieved full EASA type certification. 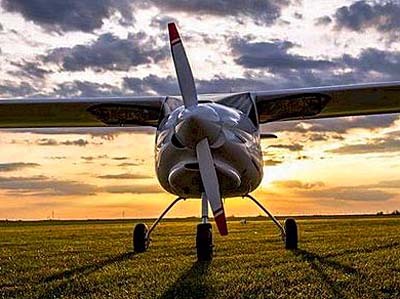 A limited number of other LSA producers have earned a Restricted Type Certificate (RTC) for their aircraft; Pipistrel noted theirs is not that but unrestricted approval by the European Union's equivalent to the FAA. While Pipistrel charges (pun intentional) off in all directions, they chose to feature their Alpha Electro prominently in their booth space or stand. The company has already delivered a few of these pure-electric-powered Light-Sport-like aircraft to flight schools that use them for pattern flight training. A quick swap of batteries to keep one set charging can theoretically allow for very economical, and quiet, operations. 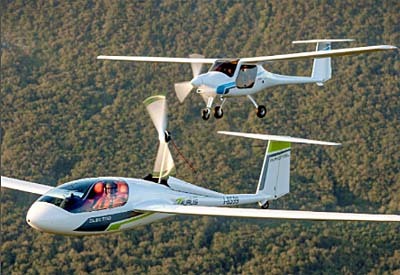 An American company is doing likewise with their Sun Flyer project but has some ways to go to catch up with Pipistrel. 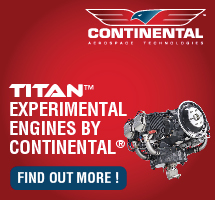 Over in the A halls, specifically in A-3, we see engine producers like Rotax — right up front in the highest traffic area — and Continental Motors, now also of Titan fame (the much-appreciated sponsor of our new video in the header above). In the A halls, visitors will find a dizzying array of flying products but also the biggest airplanes at the show. Along with their larger size, these companies mount impressive displays, like the two story-exhibit workers were assembling as I poked around early in the process. 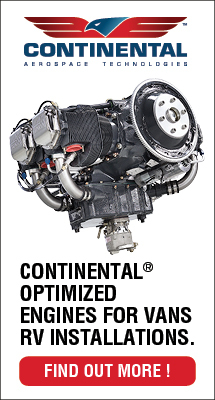 Along with their GA engines and their diesel entry, Continental displayed their Titan engine that has found favor on so many LSA in America. Company marketing guru, Emmanuel Davidson, said Continental will have some major announcements on opening day and I'll be present to hear items of interest to readers of ByDanJohnson.com. When I first started attending Aero, it was not in these giant halls. The new Messe was built after Aero began. In the first year I attended, the largest aircraft on display anywhere was a Cessna 206. Today, jets and big business aircraft are very much a part of the overall event, though I spend most of my time with the smaller aircraft that are my focus. The little guys cannot all afford to be present every year so this even-numbered year will not see the sailplane displays. Some LSA producers also don't come annually (for example, Tecnam will not be present) to preserve funds for other marketing expenses. Positively electrical and a glimpse of the future is how you might describe exhibits in the e-flight-expo. The Slovenian company Pipistrel, with a facility in very nearby Italy — where it finishes Light-Sport Aircraft intended for export to the U.S. (a necessity due to government requirements) — is one active outfit. 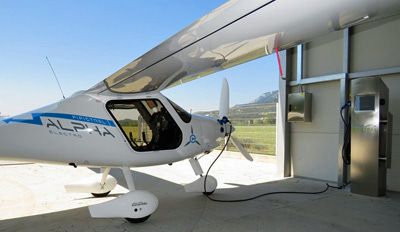 In the e-flight-expo area, in the large entry foyer on the west end of the giant complex, Pipistrel was preparing a mock-up of their supersleek four seater called Panthera with a hybrid electric propulsion system. The e-flight-expo, significantly arranged by my publisher friend, Willi Tacke of World Directory of Leisure Aviation (WIDOLA) fame, was setting up to show off the technology achievements by enormous corporations like Siemens (supplying the motor on the Panthera mentioned above) and tiny companies, those enterprises that often lead the race in new innovative directions. I plan to spend some time in the entry foyer looking over the achievements of these companies. We don't know that electric propulsion, or hybrids, will truly arrive on the aviation scene anytime soon, but plenty of folks are rooting for such, including myself. One thing you will not see, as the show opens on Wednesday, will be the giant semi-tractor trailers that hauled in the merchandise. In the nearby view you see the enormous dual, tandem-wheeled trailer holding Roko airplanes (a company once associated with the aircraft now produced by BRM Aero, builder of the Bristell series). American companies have more modest funding, normally using trailers or flying their aircraft to events. Not all Europeans are so well-heeled either, but some have major hauling vehicles. The custom-built rig used by TL Ultralights was steadily being unloaded of aircraft and display equipment as I snooped around on Monday, two days before opening. When Aero open on Wednesday the 20th, I will continue my investigation of all things marvelous in light aircraft. I hope to capture some video material for later editing by Videoman Dave and I hope to post daily stories about cool aircraft and flying gear ideas I find. Stay tuned. This is going to be as interesting as ever, I predict. The great show of Europe called Aero Friedrichshafen is about to begin. It starts officially tomorrow and runs through Saturday (April 20-23, 2016). I’ve lost count, but believe this is my 20th year of attending, far more than any other European show. As he worked to help exhibitors and manage the million details of his event, boss Roland Bosch said the event started in 1977, meaning next year would be its 40th, but… Aero alternated years from 1977 through 1991 (as do many European airshows). With the 1993 event it went annual, meaning this is the 31st Aero. On Monday, the vast 11 halls of the Messe (the facility name) were largely empty but slowly becoming populated with airplanes. In all of the gymnasium-sized halls with their elegant curved wood roofs, workers assembled displays. In Halls B1, B2, and B3 — where the light aircraft I follow are concentrated — displays are more elaborate than anything we typically see at U.S.
Read More About: Alpha Bristell Bristell (NG 5) SLSA BRM Aero, s.r.o. 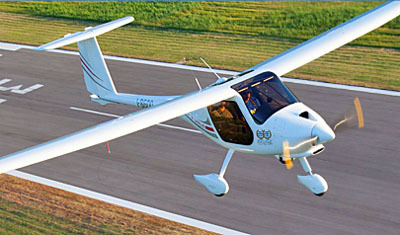 Pipistrel LSA s.r.l. 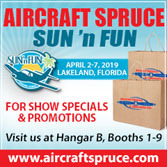 At the recently concluded Palm Springs Expo, a keynote address was provided by George Bye, the man behind the Sun Flyer project that aims to put electric two seaters into flight schools. Pipistrel is already selling into this market with its Electro (video) and while only a small number of aircraft are in use, the race is on for more ... much more. Airbus made big news back in July when a race developed to see who would cross the English Channel first in an electric powered airplane. Of course, the whole thing was a bit moot because it had been done years before. 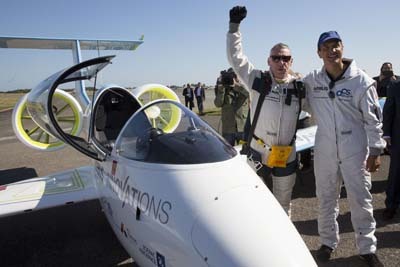 Longtime electric pioneer Eric Raymond of Sunseeker Duo noted, "It was already done in 1981 by the Solar Challenger, which flew from Paris to London at 14,000 feet. [Famous hang glider pilot and manufacturer Gerard] Thevenot even flew an electric trike across. Both 2015 flights crossing the English Channel (around 20 miles over water or a bit over 30 as E-Fan flew) seem rather modest compared to the ocean-spanning attempt by Solar Impulse 2. Airbus' E-Fan 1.0 flew 46 miles to Calais in France in 36 minutes at an altitude of about 3,500 feet. The tandem two-seat E-Fan uses a wingspan of 31 feet that produces a 16:1 glide. Its twin ducted electric motors with variable-pitch propellers are powered by a series of 250-volt lithium-ion polymer batteries. Hugues Duval's miniature airplane, the Cri Cri, beat E-Fan to Calais by about 12 hours. The tiny aircraft has only a 16 foot wingspan lifted by two 35-horsepower Electravia electric motors. Cri Cri flew at 65 mph. According to reports, Duval's Channel crossing took only 17 minutes, which was good as his battery life was said to be 25 minutes. He benefitted from being launched by another airplane (see earlier article). A third electric Channel-crosser, Pipistrel, was denied a chance to beat them both when electric motor maker, Siemens, suddenly refused to allow the company to fly its motor over water (though one wonders how the motor was supposed to know it was no longer over land where it performed just fine). 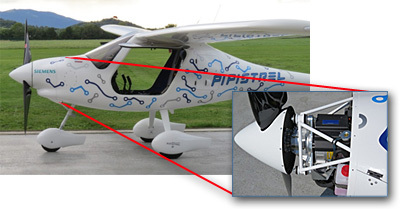 Here's an earlier article about Pipistrel's WATTsUP, since renamed Electro. All the corporate race-across-the-Channel drama notwithstanding, the future for electric power has the smell of inevitability, if for no other reason than giant Airbus dropping tens of millions into their development. Why would they make such an investment? Simple: electric airliners are in their future. Airbus stated its goal of creating a 100-passenger electric hybrid planes that could enter service by 2030. I'll discuss that below (also see image). The advantages of electric propulsion are several, according to Airbus: lower noise that doesn't bother airport neighbors; reduced carbon dioxide (CO2), nitrous oxide (NOx), and particulate emissions; and, reduced vibration. All three benefit the pilot as well. For example, when I flew the eSpyder, lower noise was more pleasant and made me aware of noises on the ground that I would never have heard with a headset on and a reciprocating engine roaring. Less vibration is also not only a lesser wear factor for airframes but also for engines and the pilot will benefit physiologically. You might not notice reduced emissions as viscerally but cleaner air surely benefits everyone. Airbus Group plans what they call the "world's first series production electric planes," specifically E-Fan 2.0 and 4.0 aircraft, the latter being a four seater. Work on the new all-electric, battery-powered two-seater pilot training version and the four person hybrid electric motor/combustion engine version will be pursued by Voltair SAS, a wholly-owned subsidiary of Airbus. The two models will be built at a 16,000 square foot facility located at Pau Pyrénées Airport in the southwest of France, sometimes called "Aerospace Valley." Construction of the E-Fan assembly line is to start next year and a first E-Fan 2.0 should fly in late 2017. Airbus Group committed about $22 million for development of the E-Fan 2.0 production aircraft. They will build to European CS-LSA certification using ASTM standards at a gross weight of under 600 kg (1,320 pounds). So, the two seater will be a Light-Sport Aircraft even if it may not be called that. 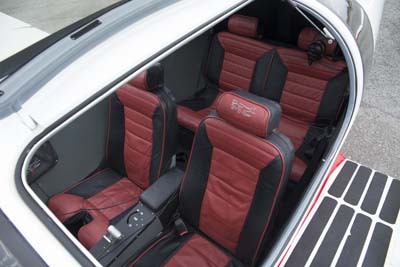 The hybrid four seat E-Fan 4.0 is targeting 2019. Spending by jet engine maker Rolls Royce began in 2012 with nearly a billion dollars for metals, composites, vehicle integration, electronics, systems engineering and information technologies. Airbus joins with Rolls Royce and others, all captioned under something called the DEAP project for Distributed Electric Aerospace Propulsion. Their goals include reducing CO2 emissions by 75%, NOx by 90%, and noise by 65% compared to standards in 2000. As the nearby image shows, the airliner concept involves three ducted fan motors on each side of the fuselage (looking much like the E-Fan's motors though much larger). Such a system will obviously required a far higher level of integration with the airframe than just slinging a high bypass jet engine under the wing. An advanced gas-powered unit would provide power for the six motors buried in the wings. Airbus refers to this a "serial hybrid propulsion system." Coming back to the present day to the smaller airplanes that fascinate readers of this website (and those who watch our YouTube videos), you might wonder, "Why spend time on projects aimed at 2030 to 2050?" 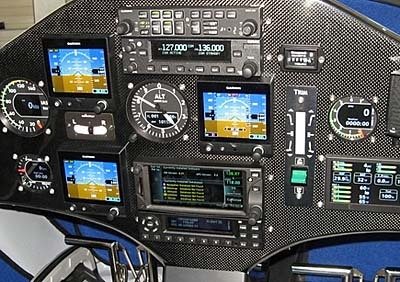 All you need do is consider how giant companies spending many hundreds of millions of dollars can result in developing technologies useful for Light-Sport Aircraft, light kits, and ultralights. Although we already have electric-powered ultralights that work quite well for single pilots (see short article here and here; a video; or, a full-length article) and while we have emerging LSA that should do duty as flight trainers and local area fun flying, taking bigger strides is necessary for an airline design. Such esoteric ideas as superconducting machines (motors) and cryogenic cooling intended for airline use may be tested on LSA and light GA planes. While all this sounds rather far-out, a kind of science fiction story, the urgency for lower emitting, quieter airliners, and what will surely be escalating fuel costs may drive some interesting concepts that small airplane makers can use. Small companies can be very nimble and may more quickly employ ideas behemoth companies like Airbus and Rolls Royce can't put into use for years. I can't fully imagine where this electric future leads us but electric power for aircraft is certainly coming. 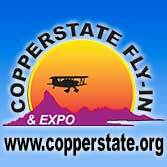 At the recently concluded Palm Springs Expo, a keynote address was provided by George Bye, the man behind the Sun Flyer project that aims to put electric two seaters into flight schools. Pipistrel is already selling into this market with its Electro (video) and while only a small number of aircraft are in use, the race is on for more … much more. 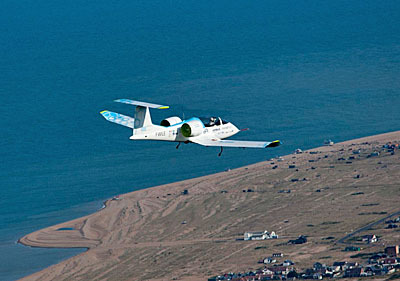 Airbus made big news back in July when a race developed to see who would cross the English Channel first in an electric powered airplane. Of course, the whole thing was a bit moot because it had been done years before. Longtime electric pioneer Eric Raymond of Sunseeker Duo noted, “It was already done in 1981 by the Solar Challenger, which flew from Paris to London at 14,000 feet. [Famous hang glider pilot and manufacturer Gerard] Thevenot even flew an electric trike across. When discussing big versus small, you cannot go much further than comparing a Light-Sport Aircraft company to Airbus. This story speaks to LSA builder Pipistrel, the goal of their French dealer, and nearly identical plans of the giant corporation. In a fascinating development, it turns out that an even smaller entity, a single individual in a miniature flying machine, managed to best the jet airliner producer at its own game. Here’s the story as I understand it although I readily admit I am relying solely on second-hand information. 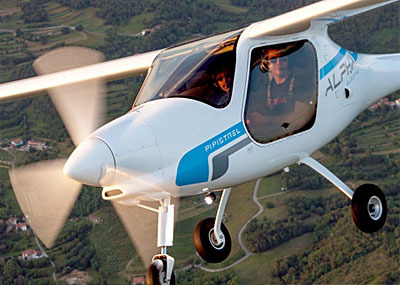 Pipistrel makes the Alpha Electro (formerly known as WattsUp as our video at the end notes). They’ve already seen some success with this aircraft the factory model of which has been powered by a Siemens motor supplied by the huge Germany company. As everyone who follows reporting of electric propulsion of either airplanes or electric cars surely knows, “range anxiety” is a consumer problem to be overcome and taking flights demanding courage is one way to assuage those concerns. Aero is such an interesting event for many reasons. Among the most significant of these are the large number of aircraft introductions or the newest development projects one discovers in the vast gymnasium-sized halls ... eleven of them in total. It can be hard to cover all the square meters, which although not as enormous as giant outdoor American shows, are nonetheless so packed with aircraft that one gets sensory overload before you've seen them all. The world premiere of BlackWing was such a project. Here is the first light aircraft I've seen from Sweden; others may exist but I'm not aware of them. This sleek speedster uses the ubiquitous Rotax 912 to achieve what they state as stunning speeds up to 400 kilometers per hour (250 mph or 217 knots) and this from only 100 horsepower! Of course, this won't work as a Light-Sport Aircraft but BlackWing is LSA in size and concept other than its blazing speed. She's lovely and steadily drew a crowd. Across the way — the convention center housing Aero is two rows of giant halls, an "A" and "B" side — was the equally speedy Swiss airplane called Risen. Later we hope to put up a video interview I did with developer and company chief Alberto Porto. Risen is also aimed at the European microlight market that allows qualities not permitted on a U.S. Light-Sport. As Alberto explained, designers must achieve a maximum stall speed while keeping weight within the 472.5 kilogram limit (1,040 pounds), which number includes an airframe parachute that nearly all have because they are required in Germany. Risen has the works all as standard equipment Alberto described: retractable gear, in-flight adjustable prop, power-opening canopy, a brilliant implementation of Fowler flaps that seem to extend forever, 48-inch-wide cockpit, three-screen Dynon SkyView, autopilot, all carbon fiber, emergency parachute, luxury interior, and I'm surely leaving something unsaid. Of course, you can expect to pay for all this, to the tune of about 200,000 euros. Yet if you want maxed out performance for the class, Risen maybe it. Pipistrel made its usual splash showing their WattsUp electric powered trainer model, now renamed Alpha Electro conforming to the naming convention used on their previously electric Taurus Electro motorglider. Alpha was introduced as their low-priced entry as we saw in the USA a few years back. 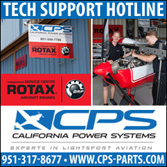 Now, they've installed an electric motor and easily-removed batteries in the compartment that otherwise holds the Rotax 912 they use on most other models and on gasoline-powered Alphas. The Alpha Electro concept is that you fly basic flight training at or near the home field. It can make about an hour's flying on the batteries of today, but those cells can recharge in 45 minutes, plus a very wide prop aids regeneration of the batteries as you descend for landing with the now windmilling prop pushing charge back to the cells. Upon completing the training flight, a technician replaces one set of batteries with another and back up the airplane can go. Pricing is about 120,000 euros so flight schools may see merit to using electric power for instructional flights. On a video my journalist friend James Lawrence talks about his planned travel to check out this capability. Watch for it later. Alpha Electro is here now, but I found another electric airplane project that I was tempted to pass by as merely a concept that might go nowhere. However, it was simply too impressive so I spent some time talking with principal developer and current airline pilot, David De Ridder. He and his team have formed Green Tech to develop Ypselon. My visual fascination with the project stopped me, but it was David's reasonable, honest-sounding approach that drew me in fully. He's not blowing smoke about when this can happen, giving dates of 2017 and 2019 for finalized development and reaching the market. Like Alpha Electro, Ypselon is an electric pure play but unlike the Electro's training mission, Ypselon is aimed at the recreational user who wants a performer. Seating is tandem with even the aft seat occupant able to see down in front of the wing. 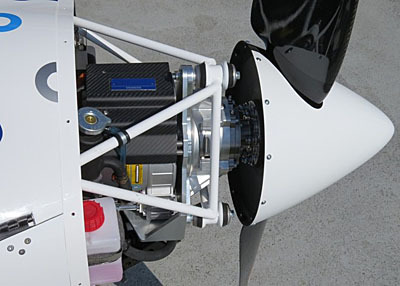 Using electric power, a rear prop doesn't need a driveshaft as from a gas engine so the design can be incredibly clean. Though it will be some time before we see more, David says he has funding to proceed and as I've long maintained, the most exciting electric-powered aircraft are coming from the light end of aviation where they are possible today. I'll keep an eye on this one! Going even further into the fuzzy future, I discovered another "wow" project from ScaleWings. If that name sounds vaguely familiar to you it may be because you remember the mind-boggling FK-51 project reported earlier (video) that makes a highly authentic P-51 lookalike that can fit both European microlight or U.S. LSA categories. Indeed, Hansen Air Group is awaiting their own FK-51; it won't be available by Sun 'n Fun, but look for it at Oshkosh and prepare to spend serious time looking over this amazing production. Since that aircraft is coming to reality, the flying car project the ScaleWings designer showed at Aero caught my attention. One problem I have with most roadable aircraft is that they must leave their folded wings still exposed to road rash while in auto mode. That worries many folks so when I saw the ScaleWings SW91 Aeros project I got it. This surprising project employs six rotors four of which pivot back inside the car body for road use, thus no wings are exposed to that dump truck with its load of rocks. It seems pretty far out and may never get to market but the idea is certainly intriguing. Back down to Earth comes the final form of Beringer's Anti-Ground Loop tailwheel concept. I've written about this earlier and it is a superbly simple way for a pilot to avoid the dreaded situation of the tail wanting to get sideways during landing (if you do not keep the rudder moving to hold the taildragger straight enough). The idea was correct before but now the company — celebrating its 30th anniversary this year — displayed the final version in two sizes. I shot a video with Beringer front person Claire Beringer at Aero and we'll hope to get that up in the future, but the final iteration is even more elegant than the original solution. They've now completed their typically gorgeous hardware to make the tailwheel a cantilevered construction (photo). 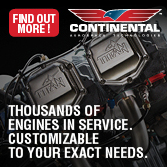 This company has made inroads throughout the aviation spectrum from LSA to Cirrus and beyond. If you love the idea of taildragger flying but feared the ground looping potential, Beringer's AGL Tail Wheel can relieve your concern while yet preserving the ability to pivot around within a wingspan, through a cockpit control that unlocks the tailwheel for full swiveling but holding it to a small motion for takeoff and landing. Good job, Beringer! Aero is such an interesting event for many reasons. Among the most significant of these are the large number of aircraft introductions or the newest development projects one discovers in the vast gymnasium-sized halls … eleven of them in total. It can be hard to cover all the square meters, which although not as enormous as giant outdoor American shows, are nonetheless so packed with aircraft that one gets sensory overload before you’ve seen them all. The world premiere of BlackWing was such a project. Here is the first light aircraft I’ve seen from Sweden; others may exist but I’m not aware of them. This sleek speedster uses the ubiquitous Rotax 912 to achieve what they state as stunning speeds up to 400 kilometers per hour (250 mph or 217 knots) and this from only 100 horsepower! Of course, this won’t work as a Light-Sport Aircraft but BlackWing is LSA in size and concept other than its blazing speed. 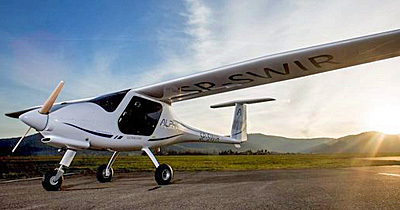 Read More About: Alpha Beringer Aero Blackwing Sweden AB Pipistrel LSA s.r.l. Electric aircraft continue to develop rapidly and the most visible actions are on ultralight aircraft such as Zigolo, eSpyder, or Light-Sport Aircaft (Evektor EPOS) as these are the lightest and therefore most workable candidates for electric power today. At Oshkosh we heard more about the two-seat SunFlyer in development by Bye Aerospace and those who visited the Fun Fly Zone (the place formerly known as the Ultralight Area) saw electric aircraft regularly flying as they have for several years. Now, one of the leading creators of electric airplanes is making a bigger push to offer a training-capable aircraft. As with several Pipistrel models the name is a bit unusual but WATTsUp is a two-seat electric trainer based on Pipistrel's Alpha (video). WATTsUp took its maiden flight on August 22nd. 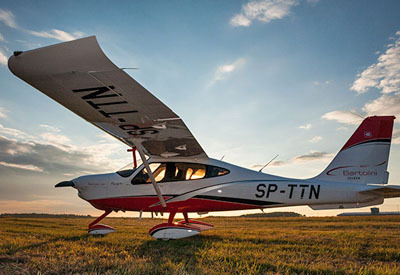 The Slovenian company unveiled the new aircraft on August 30th at a popular recreational aircraft show south of Paris called Salon du Blois. 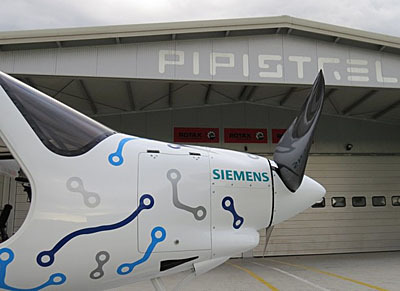 Pipistrel said the electrified Alpha was developed in partnership with Siemens AG, a global powerhouse focused on "electrification, automation, and digitalization." Siemens provided the electric main propulsion components. "Every single element of the aircraft has been refined to be lighter, more efficient and more reliable," reported Pipistrel. The 85 kW (114 horsepower) electric motor weighs 31 pounds. A 17 kWh battery pack — the same power as used on the upgraded 2014 Chevy Volt electric car — is designed to be replaceable within minutes or charged in less than one hour. Remember, the purpose of WATTsUP is for flight training, usually done close to the airport. Performance of Pipistrel's electric trainer is aimed at flight schools with "...short take-off distance, 1,000 fpm climb, and endurance of one hour plus a 30 minute reserve," said the company. WATTsUP is optimized for traffic-pattern operations; Pipistrel observes 13% of energy is regenerated on every approach to landing, replenishing the batteries and thereby increasing endurance. "With the ever-growing cost of fuel it is time to rethink pilot training," said Ivo Boscarol, CEO of Pipistrel. "Our solution is the first practical all-electric trainer." He said technologies developed specially for this aircraft cut the cost of pilot training by as much as 70%. WATTsUP claims to meet microlight and ASTM LSA criteria, as well as standards for electric propulsion. The company said the electric trainer is already certified in France where it made its market debut. "More countries will follow soon," believes Pipistrel, and they reported that they are applying for an exemption with the FAA to allow training operations as an SLSA. "WATTsUP is our fifth electric aircraft project and the second to result in a commercial product," said Pipistrel. The company expects to bring the final product to the market in 2015 with a target price below €100,000 or $138,000 (though remember, not having to buy gasoline will offset some of this cost). Frank Anton, Executive Vice President Traction Drives, Large Drives, Siemens AG, said, "Siemens is developing electric drive systems with highest power-to-weight ratio for aircraft propulsion. Only with innovation we can solve the problems of rising fuel costs, rising passenger demand, and rising environmental regulations." Pipistrel said Mr. Anton is the initiator of electric aircraft development at Siemens. "As electric drives are scalable, we can expect that in the future larger aircraft will also use electric propulsion. The world is becoming electric, whether in the air, on land, or at sea." Indeed even airliner behemoth Airbus said it will enter the market for small two-seat, then four-seat electric aircraft (with a possible electric airliner to follow). The Siemens Industry Sector, based in Erlangen, Germany boasts being the world's leading supplier of innovative and environmentally friendly automation and drive technology, industrial software, and technology-based services. The Siemens division pursues product design, engineering, and production. The German giant has a global workforce of more than 100,000 employees. Electric aircraft continue to develop rapidly and the most visible actions are on ultralight aircraft such as Zigolo, eSpyder, or Light-Sport Aircaft (Evektor EPOS) as these are the lightest and therefore most workable candidates for electric power today. At Oshkosh we heard more about the two-seat SunFlyer in development by Bye Aerospace and those who visited the Fun Fly Zone (the place formerly known as the Ultralight Area) saw electric aircraft regularly flying as they have for several years. Now, one of the leading creators of electric airplanes is making a bigger push to offer a training-capable aircraft. As with several Pipistrel models the name is a bit unusual but WATTsUp is a two-seat electric trainer based on Pipistrel’s Alpha (video). WATTsUp took its maiden flight on August 22nd. The Slovenian company unveiled the new aircraft on August 30th at a popular recreational aircraft show south of Paris called Salon du Blois.